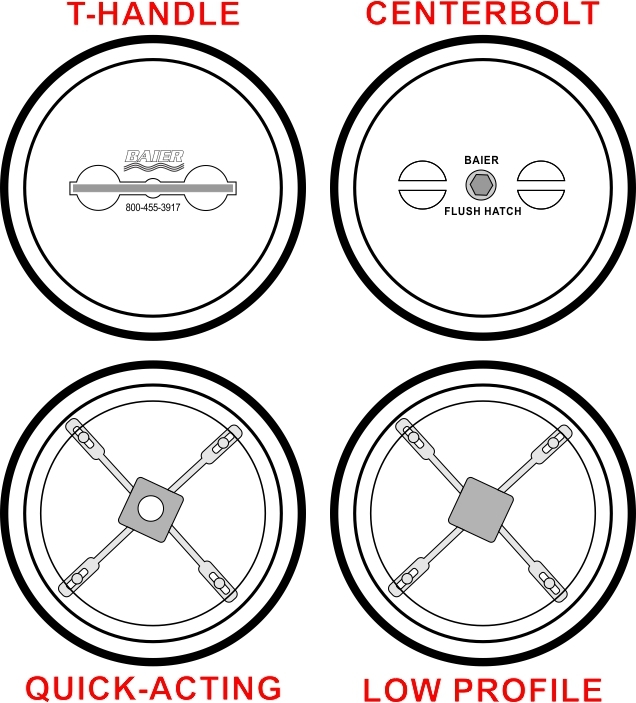 Baier Marine offers the following types of flush deck watertight hatch closure systems for your selection. Baier Flush Deck hatches feature standard safety features such as built-in underside escape handles. All of our hatches have either a built in T-handle or can be operated with a secured and stowable hex head T-handle wrench. Our Commercial hatches are secured using either the adjustable 4- dog quick acting styles or the traditional strongback style that allow you to adjust the clamping pressure. Many of our hatches are also available in cast steel and with built-in hinge.Please choose the type of hatch you are looking for or click on the images to find out more about the features of each hatch. Designed for workboats, these hatches and multi-bolt steel manhole covers are ideal watertight closures. Engagement styles: Built-in T-handle or hex-drive center-bolt with strongback, Quick-acting 4-dog, and multi-bolt closure mechanisms. Please review our Hatch Type Feature Comparison at the Bottom of the current page.